What are the best accounting certifications that employers actually care about and that can actually benefit your career? In this video and post we’ll cover the how, the why, the what, and some salary expectations of the most common accounting certifications. Now there are quite a few other accounting certifications out there. Usually most other accounting certifications would be an add on to a CPA… in general. So we’ll start with the CPA. CPA stands for certified public accountant. This is the most valuable, most respected accounting certification for work in accounting, tax, audit, compliance, risk management, etc. It’s granted by the American Institute of Certified Public Accountants, or the AICPA. 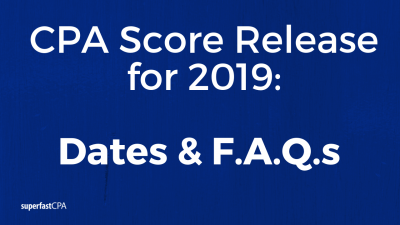 The experience required: You need a year of experience working under a CPA, however that is after finishing a bachelor’s degree and in pretty much every state at this point, you need a master’s degree as well, or at least the equivalent credit hours of a master’s degree. There are four exams to pass. Well there are four… as far as the big national exams there are four of them, and then each state will usually have an ethics and a laws & regulations exam. So depending on the state it might be slightly different, but everyone has to pass these four main CPA exams. The exam time is 16 hours total; on each exam you have four hours to complete the exam. The estimated cost for the CPA, again, this is after finishing a bachelors and a masters, so we’re not counting those costs, but the actual costs to take the exam once you’re eligible for the exam would be somewhere between $2,000 to $3,000. The next one is the CFA, which is a Chartered Financial Analyst. This is also a highly valuable certification for work in finance and investments. This one takes most people two plus years to pass the three exams. Experience required: you need four years of relevant experience. The CFA certification is granted by the CFA institute. Like I just said, you need four years of relevant experience and you do need a bachelor’s degree. There are three levels, or there’s three exams. Each CFA exam has to be passed to be able to move on to the next one. 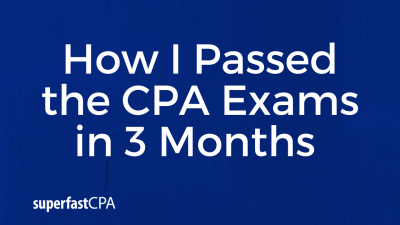 I mention that because with the CPA exams, you can take those four exams in any order. The exam time is 18 hours total. The estimated costs are similar, somewhere between $2,500 to $4,000 to pass your CFA. The next designation is a Certified Management Accountant, or the CMA. This would be for specializing in internal management accounting functions. Most people I would say would already have their CPA if they went and got this certification. Not always, but this is specifically for management accounting, meaning you’re working on the accounting internally within an organization. This is granted by the IMA, the Institute of Management Accountants. Experience required is two years of relevant experience. The education requirement is a bachelor’s degree. For this one there are two exams, 8 hours of total exam time and the estimated cost is around $2,000. The next designation is an Enrolled Agent. Normally this would be for somebody who has done some tax preparation, meaning they have some experience in tax preparation and they want to take the next step and become an enrolled agent. A CPA is definitely a level above an Enrolled Agent and a CPA can do anything an Enrolled Agent can do. Obviously an enrolled agent prepares tax returns, sign as the preparer, and represent clients in front of the IRS. The CPA can do all of those things as well. But the EA specifically, it’s for US based tax work. It’s granted by the IRS. The experience required: there’s no formal or quantified level of experience or a time stated, but normally no one would just go in off the street and try to take these exams. It would usually be somebody who has done some work in tax preparation and they just want to get an actual certification. There’s not a formal requirement for education either. There are three exams to become an enrolled agent. The exam time is 12 hours total. Each exam is four hours and the estimated cost to become an enrolled agent is around $1,500. The next designation is a CIA, a Certified Internal Auditor. This would be for someone if you want to specialize in risk management and internal controls within an organization. So in a bigger company that has an entire internal audit function, you would be an internal auditor. This is granted by the Institute of Internal Auditors. The experience required is two years of relevant experience. It requires a bachelor’s degree. For this certification there are three exams. The total exam time is 6-1/2 hours and the estimated cost is somewhere around $1,500. So now we will talk more about the CPA. The CPA is highly valuable and it literally leads to making more money throughout your entire career. It also provides a very high career ceiling. It’s a very tough process to pass the four exams and in most states, like I said, it requires at least a year of experience working under a CPA. For most people, that usually starts out by working at a firm, and that takes care of the experience requirement. It’s also something that you work years towards because it requires a bachelor’s degree and a master’s degree. If you’re going into accounting or you think you might be, the CPA is what you should set your sights on. The CPA again is the most widely used, widely respected, overall most valuable accounting certification there is. There are jobs in any industry or sector, private, public business, government, not for profit and of course taxation and everything in between. In any industry, there are obviously accounting jobs available to CPAs. Let’s go over some expectations on CPA salaries. Now the following, especially the numbers towards the higher end, this is all assuming that you get your CPA, you take your career serious, you put in the work and you increasingly become more and more valuable to your company or your firm. Meaning of course that you’re always improving, becoming more valuable, increasing your knowledge base and your expertise… and moving up. So you will likely start somewhere between $50,000 to $75,000 and it’s important to note that the normal process as you’re coming out of your master’s degree, you would be getting a job at some firm or in accounting at some company and you’re a non-CPA at this point. So you’re starting that first year of experience that you need and hopefully you finish your CPA exams sometime in the first two years. Of course within the first year is ideal – you obviously want to get them done as soon as possible. At the 3-5 year mark you could expect to be in the $60,000 to $90,000 range. If you’re in public accounting you’ll likely be a senior at this point. Then at the five to seven year mark you could be between $75,000 to $120,000. It’s also important to note that around this five to seven year mark there is a huge range depending on your career path. For most people that start in public accounting, by this point most people that started in public accounting have gone into industry. So there’s a wide wide range of career experiences and salaries at this point in the timeline. As you get into management, upper management – wherever that may be – if you’re still in public accounting or you’re in industry at the 7+ year mark, the range could be between $130,000 to $200,000+. As time goes on and you’re decades into your career, again, there’s obviously a huge range of potential outcomes. So some of the pros of the CPA, which you’re probably understanding at this point, is it’s a very safe, very stable career with prestige, respect, financial rewards, and great benefits. There’s a very high career ceiling, a very diverse career path. There’s many different opportunities in any industry. The CPA is one of the accounting certifications that provides a robust and satisfying career. You become an expert in your given areas and it’s highly respected. You’re valued by your employer, your clients and the general public. Some of the cons of the CPA: the CPA exams are very hard and for a lot of people that have gone through the process, that is the understatement of the century. For some people it turns into a multi-year nightmare. Some people never finish all 4 CPA exams. Other people (albeit a small percentage) just nail the exams and they’re done in six months or less. So there’s a wide range. It’s a very tough process: you’re working full time likely, while you’re trying to pass the four exams. People have different situations, different family situations, their time constraints are different and so there’s just a big range of how long it takes someone to pass the 4 CPA exams. Whether you’re someone who gets them done in six months or it takes you two years or more, either way they will cause you a lot of stress and they’ll take a lot of time. You’re going to be doing a lot of studying. Your first few years in accounting, as far as the job itself, that will also be demanding and you’ll be working a lot. So you should just expect that. Let’s cover a few general tips to get ahead and make sure you’re on the upper end of those salaries as the years go by. Of course, always seek to improve and increase your expertise and knowledge. It seems obvious but a lot of people become kind of complacent and there are top performers and lower performers in any area. So if you can keep that in mind or keep that motivation, that you always want to be improving and becoming more and more valuable to your firm or your employer. You want to seek to take on more responsibility and you want to be proactive. You of course want to be a highly valuable asset to your company. There is a lot of satisfaction and financial rewards for becoming very good at what you do so it is satisfying to put in that time to become the go-to guy or the go-to girl for your given expertise. Don’t be a complainer. That should be self explanatory. If you consistently have problems with management wherever you go, maybe you’re the problem. You need to be able to honestly self-evaluate and become effective and highly valuable at what you’re being paid to do. At SuperfastCPA we specialize in helping busy candidates pass their CPA exams via study strategies and actual study tools. We’ve helped thousands of CPA candidates with the study process and 30,000 people plus, you know, subscribe to our emails. If you want more help with your CPA process, you could start with our free guide. 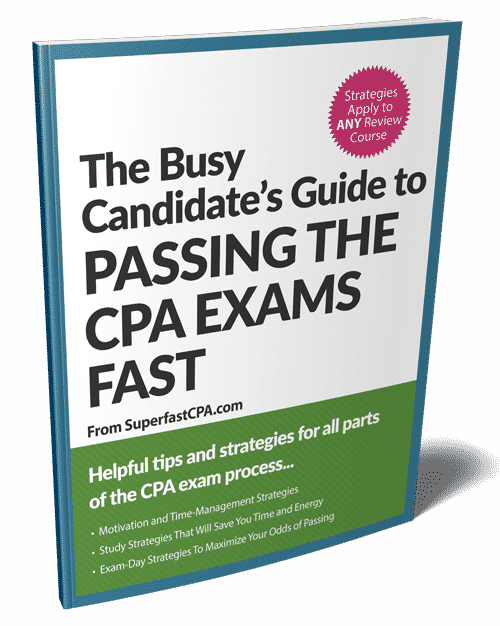 It’s called The Busy Candidate’s Guide to Passing the CPA Exams Fast. Our free guide, it’s not just generic advice on how to sign up for the exams and how long each exam takes and things like that. This guide gives you actual strategies for getting twice as much done in your daily study sessions, strategies for long term retention of what you study so that you remember it on test day, etc. Very high impact, high leverage strategy for actually helping you do better on your exams, it’s not just generic advice. So you can get it for free at www.superfastcpa.com/free or you can just text FASTCPA to 44222. 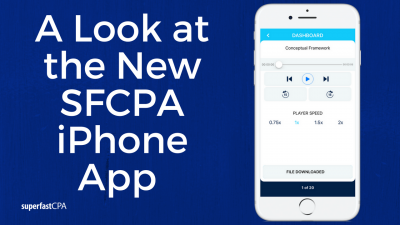 You can text FASTCPA to 44222 and a link will be sent to you to get the guide.